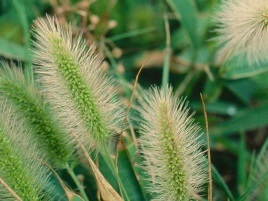 Giant Green Foxtail (Setaria viridis var. major (=var. robusta-alba, var. robustapurpurea)) is a monocot weed in the Poaceae family. In Minnesota this weed first evolved resistance to Group A/1 herbicides in 1999 and infests Soybean. Group A/1 herbicides are known as ACCase inhibitors (Inhibition of acetyl CoA carboxylase (ACCase)). Research has shown that these particular biotypes are resistant to fenoxaprop-P-ethyl, fluazifop-P-butyl, and sethoxydim and they may be cross-resistant to other Group A/1 herbicides.